A critical look at the various theories surrounding the 1995 Oklahoma City bombing, which claimed 168 lives and left over 800 injured. While we disagree with some of the article we reproduce here for reference. 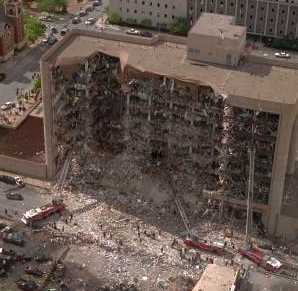 The political consequences of the bombing in Oklahoma City on 19 April 1995 show how the two sides of the American political system, liberal and conservative, work together. Since the Republican takeover of both houses in November '94, the general trend has been to the right: social spending is being cut, prison building has been increased etc.. This article examines the complementary and simultaneous agenda followed by the liberal wing of the state, reinforcing state power by promoting fear of an imaginary extreme right-wing threat. Both parties' law and order policies have been boosted. Republicans have dropped their opposition to gun control in return for Clinton's help in restricting appeals to the death sentence. Meanwhile Congress and the President used the angry aftermath of the bomb to pass a draconian set of anti-terrorism measures, giving the FBI additional powers of investigation, and the President the power to decree any group illegal at will. Congressmen have claimed that some of the unofficial militias supported the bombing. This is an outrageous lie, but as we explain below, there has been an attempt to create a climate in which it could be believed. The National Rifle Association grovelled before the gun-grabbers. The media kept up a barrage of innuendo against the accused, which no jury can be immune to. We haven't a clue who planted the bomb, nor why. Neither have all the people who have been quick to draw political conclusions from it. We should maintain a sceptical attitude to the prosecution case, as we should whenever the police are under enormous pressure to get someone. "The FBI zeroed in on the two men with remarkable speed" (Oregonian, 22 April 95). Though the worst crime in US history, it doesn't have much of a long-term significance in itself. It is not part of an ongoing wave of right-wing violence. There have been no more bombings. What is significant is what has been made out of it. The fact that the government are the main beneficiaries does not mean they did it. Another beneficiary has been the liberal establishment, that is: the liberal wing of the state and its hangers-on. This includes journalists, the publishers of most "alternative" papers, anti-racist politicians, most feminists and some Zionists. Its outer fringes include the publishers of anarchist papers. The role of the liberal left is not just to stir up moral panics in order to strengthen the state ideologically. It also materially helps the pigs. The Southern Poverty Law Center, for example, spies on people it considers to be "hate groups" and gives the information to the police. The Anti-Defamation League considers any group critical of Israel as anti-Semitic and adds them to the files. On the basis of a few vague rumours that the alleged bombers may have attended a meeting of one of the militias, an attempt has been made to generate a climate in which "anti-government" sentiment is equated with mass murder. Even verbal opposition was explicitly condemned by Clinton as contributing to the bombing by spreading "hate". The Southern Poverty Law Center has remarkable foresight. Last year, its director demanded that Attorney General Janet Reno, following her Waco victory, turn her attention to "unorganized militias". Covert Action Quarterly, a Washington DC magazine that claims to oppose the government, was also ahead of the game with a major article on the threat of a fascist uprising in America, published before the Oklahoma tragedy in the Spring '95 issue. On the case of Randy Weaver, the white separatist besieged by the FBI in an Idaho cabin in 1992, Covert Action concedes that "The behavior of federal law enforcement agencies merits criticism": they shot dead Weaver's 14-year-old son, and killed his wife whilst she held their baby in her arms. This mild rebuke is a mere footnote in a fourteen-page feature, "Angry White Guys With Guns", linking gunnies, militiamen, pro-lifers and Nazis, whom it claims are on the brink of kindling an American fascist movement. These strange bedfellows are considered more dangerous than the Federal Bureau of Immolation and the BATF. Paradoxically, part of Covert Action's definition of paranoid right wing groups is their tendency to "perceive a global conspiracy in which key political and economic events are manipulated by a small group of elite insiders", exactly the position defended in every issue of Covert Action. The Village Voice (23 May) attacked the right to bear arms as a wacky idea dreamed up by right-wing extremists. The June issue of the Progressive claims that forming a citizen's army to overthrow the government is "criminally treasonous". In their self-induced hysteria, these liberal democrats forget the Second Amendment and the Declaration of Independence which the US state claims to be based on. Not only did the authors of the Constitution see fit to bar any infringement of the right to bear arms, the colonial upstarts explicitly guaranteed the option of violently overthrowing the government in their founding document. Of course, whatever the constitutional rights, no government will tolerate its own destruction. It was not the right to bear arms that drove the police off the streets of LA in May 92, but the act of bearing arms. Calling for the rigorous enforcement of laws against paramilitary activity, (p27) the Progressive comes as close to supporting the Waco massacre as you can get without actually saying so. The victims of so much FBI provocation and terror in the not too distant past now support the strengthening of the secret police in the name of anti-terrorism. Remembering this, it condemns attacks on civil liberties... when used against the left. It supports freedom of expression for those who agree with it. As for Presumption of Innocence, the Progressive finds Timothy McVeigh guilty, not only of the bombing but, as if this were not enough, of being a heterosexual (how do they know?) white male. Love and Rage desperately tried to demonstrate that the government is really on the side of the militias, complaining that it has given them airtime with the Waco hearings (L&R Nov/Dec 95). It could hardly add that these hearings were a victory for the liberals, who skilfully manipulated the prejudices of the current political climate by washing Reno's bloody hands with emotive allegations of child abuse, since L&R's politics are part of that climate. The scare-mongering is not confined to the fringes of the liberal establishment. Here is the New York Times, 30 March, describing the investigations of an abortion clinic: "Planned Parenthood began to uncover a co-mingling of anti-abortion extremists, new world-order paranoids, Waco wackos, Reconstructionist Christians, white supremacists and assault-weapon fanatics in a national paramilitary subculture. Abortion turned out to be merely the come-on issue, designed to attract followers to a rabid, anti-government crusade". The nearest liberals come to an analysis, as opposed to a panic, is to reduce the arguments of the right to a distorted response to economic hardship. There is a material basis to the right-wing libertarian movement. Over-grazing, logging and mining have damaged the environment so much that powerful interest groups have forced sweeping environmental legislation. Not only environmentalists want to rest the West: hunters, fishermen and the tourist industry need to preserve Nature as a resource. Farmers and loggers have a more immediate need to survive. Small farmers have come into conflict with public land managers. The libertarian right, which denies federal authority to drive cows and chain saws off public land, is, roughly speaking, the political expression of this fight. But fear of the FBI, the DEA and the BATF after Waco is a judicious response to a massacre, not a substitute for complaining about economic hardship. Anti-abortion campaigners are simply people who take the not completely irrational view that an unborn child is a human being to its logical conclusion, a position which is no more (or less) crazy than animal liberationism. In other words, economic interest explains people's behaviour, except when it doesn't. It's important to see the target of the current campaign as reasoning people, rather than the goose-stepping fanatics portrayed in the demonology of liberalism. You have to understand something in order to defeat it. The new McCarthyism of the left is not aimed at demolishing the more conservative section of American society, but at diabolising it. A discourse which contains old FBI newspeak words like "hate groups" is calculated to advance its promoters, not solve the problems which led to the formation of the militias. "McVeigh and his buddies obviously wanted to rip flesh. Whether or not there was direct involvement, it is clear the perpetrators came out of the extensive network of heavily armed militias, neo-nazi and Klan formations, and the violent wing of the anti-abortion movement" (FE 346). Rather than join the prosecution, we must reject this latest version of the perennial anti-fascist crusade. Green Anarchist- bombs away? or away with the fairies?